"The House is . . . ALIVE!" The movie, Monster House, is exactly that. Three teenagers want to know what is going on with this house, it is very different than anything they have ever seen. A house that is recognized, to be alive. An elderly man lived there, and claimed to hate children. It is wonderfully directed by Steven Spielberg and Robert Zemeckis. This is the first time these two directors have worked together in quite some time. The kids call the police, but of course they don't believe them. A house that is alive and eats things and people? Its almost Halloween, 'these kids are sure telling some tall tales', is what the officers think, until...they are swallowed up by this horrible house! After much investigation, it is found out by an expert of the Supernatural, that this house is a 'deadly home'. It is found out that this house is has become a monster because a human soul has merged with a structure. The monster house must tube killed, but how do you kill a building? You must destroy its heart, its way of life. The heart is discovered to be the fireplace, after the teens remember the chimney has been smoking since the elderly lady of the house died. The only way to do this, is blow it up with dynamite. After the house has eaten everything that has landed in the yard, and the police, and the kids, it is time to stop this thing, but how? The kids force the house to vomit them out, it worked, they got free. After being freed from the house, they bumped into the elderly man, who they thought dead, and the soul in the house, and he explains it is his deceased wife who is the monster in this house. His late wife was a part of the circus, but she hated it. She may have been something like, "the worlds largest woman', since she was very obese. The man explained how he fell in love with her anyway, despite her size or occupation. After the two got together they decided to build this house. Well, one Halloween, the kids trick-or-treating in the neighborhood came and made fun of the woman, so she tried to hurt them and fell into the foundation of the house, where there was wet cement, and she died. Her husband built the house over top of her concrete encased body, because that's what she would have wanted, but it caused the house to become a monster. In the end, these brave teens finally kill the house, after being chased by it. 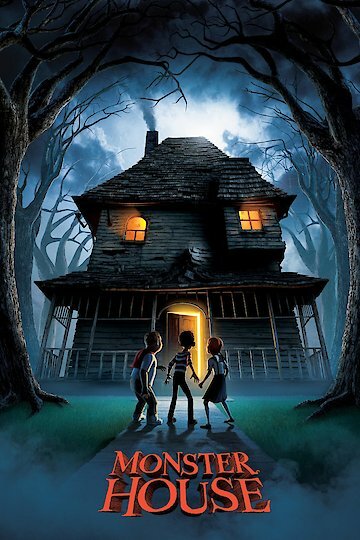 Monster House is currently available to watch and stream, download, buy on demand at Netflix, Amazon, Vudu, Google Play, FandangoNow, iTunes, YouTube VOD online.